Eltronicschool. - This is one of radio circuit schematic for you who like with transmitter project. In here we will show you one of Low Power AM Transmitter Based on Transistor circuit schematic look like in Figure 1. In this time, based on transistor, capacitor, and inductor components, we will give you one of global description about this circuit schematic beside we give you schematic and component list. Circuit schematic like in Figure 1 above is Low Power AM Transmitter Based on Transistor. 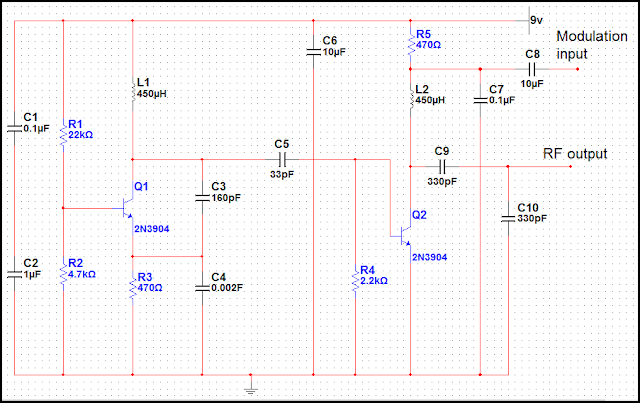 With this circuit schematic, you can build your self the basic of Low Power AM Transmitter Based on Transistor. According Electroschematics site describe that this transmitter is basic but allows transmission of audio to an AM radio. It consists of an RF oscillator operating in the AM broadcast band, together with a modulator stage, which mixes the incoming audio and the RF. A signal appears on the output, which has an AM component that can be picked up on a nearby AM radio receiver. The transmitter' part consists of modulator/buffer stage Q2 and oscillator stage Q1. Q1 is biased via R1, R2, and R3. L1, C3, and C4 form the tank circuit with feedback network C3-C4 providing feedback to the emitter of Q1. RF voltage at the junction of C3 and L1 drives buffer/modulator stage Q2. Q2 is biased by base current produced by RF rectification in the base emitter junction of Q2. C6 is an RF and AF bypass capacitor. C9, C10, and L2 form the tank circuit for the collector of Q2. RF is taken from the junction of C9 and C10 and fed to a short-wire antenna. Audio is fed to modulator Q2 via C8 and isolation resistor R5 and mixes with the RF signal in the collector circuit of Q2, producing a signal that has sum and difference frequencies if the RF carrier and AF input along with the carrier signal.